Fishing line clippers of some sort are a necessary tool in your fly fishing tackle box. You'll need them whenever you want to change a hook or cut excess leader or tippet after tying a knot. They can sometimes come in handy if you get your line snarled as well. The simplest clipper is to simply carry a nail clipper with you. These work just fine for many fishermen, but at the same time, they can be a little trickier to use. Clippers made specifically for fishing can offer a lot more through their design and ease of use. This little tool is one of the least expensive items you'll want with you all the time. All the same, you'll find it one you don't want to live without. Clippers that are made specifically for anglers are designed to deal with odd angles, heavy fly line, and for easy access so you don't need to dig through your tackle to find them. Prices for fishing line clippers range from just a couple of dollars to a little over $20. For a few dollars you can get a durable metal clipper that you can hook onto your vest or angler's lanyard for easy access. If you want to spend a couple bucks more, you can find similar models on a clip-on retractor. 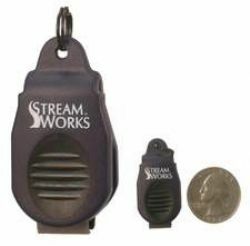 This lets you easily grab your clipper and pull it out to use, then you can just let it go and it retracts automatically. You could opt for one that not only has an easy to use clipper, but has other tools included. 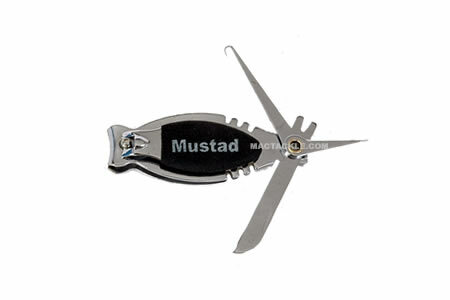 Available in stainless steel, this sharp clipper also includes a protected eye pin to clean the eyes on your hooks. Another interesting one on the market is a curved plastic cutter that contains razor sharp surgical stainless steel blades that act as a guillotine to cut through fly line as heavy as 150 pound test. 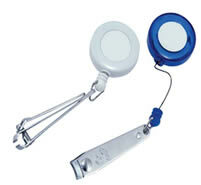 Lightweight, they can easily be attached to a lanyard or a retractor. There are no sharp edges exposed, so it is a very safe one to use. For a little more money, you can get a line cutter that also has a knot-tying tool, a needle, and a hook hone. Some of these tools have the blades at a 45 degree angle to make it easier to use while fishing. Another way to go with a multi-function clipper is to choose one that is ergonomically designed so you have a secure grip. A flat blade makes using this tool even easier than the typical guillotine style, and some even have a line pick so you can help untangle snarled lines on your reel. For a top of the line tool, look for the colorful anodized aluminum fishing line clippers. They feature a tubular, aerospace grade aluminum body, stainless steel blades, and razor sharp edges. This is a cutter any angler would be proud to hang on his vest. The blades retain their edges for a long time, and can easily be resharpened when needed. Another way to go with clippers is to find a multi-tool that includes a pair of fishing line clippers or scissors. You can keep it handy just like a stand-alone clipper, but it provides you with many other tool options. You can find them with only a few additional tools, like a hook sharpener, a line pick, a jig eye buster, a disgorger and the clipper; or you can go for the whole hog and get a comprehensive multi-tool that contains everything but the kitchen sink. Either way you go, this single simple tool is a must have while fly fishing. If your line cutter doesn't come with a retracting reel, it can be purchased separately for under $10. This simple attachment can make using your clipper much easier. If you have health issues like arthritis or other problems, having that retractor solves the problem of fumbling for your clipper or dropping it. For further information, please visit our ONLINE FLY SHOP.